Jack Berry had a big weekend for the Badgers, and he’s getting rewarded. 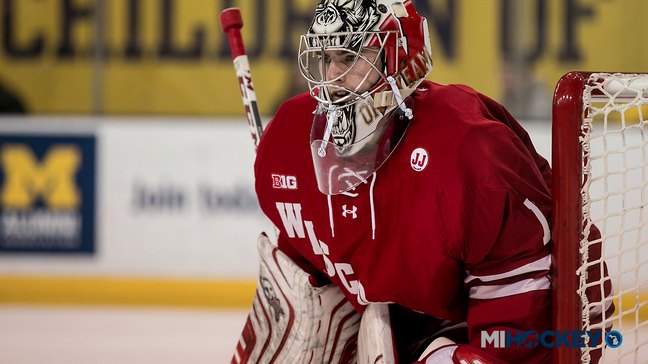 The Holly native and junior goaltender for Wisconsin was named the Big Ten’s third star of the week today, after he led UW to a pair of wins over Boston College. Berry made 57 saves over the two games, helping the Badgers start their season with a sweep of the No. 10/12 team in the country. On Friday, the Little Caesars, Victory Honda and Compuware alum posted his fourth career shutout after making 29 saves against a dangerous Eagles line-up. Saturday, he did just enough to help the Badgers outscore BC, making 28 saves in a 7-5 barnburner. This is Berry’s fourth career Big Ten weekly award.